PUNE, INDIA--(Marketwired - Nov 11, 2013) - Dhingana (www.dhingana.com), the leading global Indian music streaming service, announced today a partnership with India's 3rd largest mobile operator, Idea Cellular, to debut an industry first -- a co-branded music subscription service, which allows users to download unlimited music with no data charges. The service is available to over 127 million Postpaid and Prepaid users of Idea using Android Smartphones and WAP Feature Phones. Idea's subscribers will be able to download unlimited songs, albums and playlists, in HD quality and ad-free -- like Dhingana Gold on iOS -- but unlike iOS will not be charged for data. The downloads are encrypted on the device and subscribers can listen to them only using Dhingana's Android App. Idea's WAP subscribers will be able to stream music ad-free without being charged for data. Dhingana has developed a carrier-class Billing Platform for subscription services. It is capable of deeply integrating with Mobile Operator's SDP/ Billing Systems and has cutting edge features like metering data consumptions across multiple PLMNs, real-time co-branding with Mobile Operators, automatic fall-back pricing based on subscriber's prepaid account and 1-click subscription with auto-renewals. 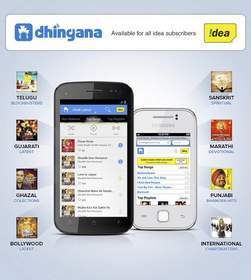 According to Sashi Shankar, Chief Marketing Officer, Idea Cellular, "Idea pioneered Music related VAS offerings on the mobile platform in India. We continue to innovate to bring rich musical content to our users through different formats. With the new music subscription service, over 127 million Idea users will be able to download unlimited music, both on Android-based smartphones and on feature phones." Rohit Bhatia, CEO of Dhingana says, "The co-branded music subscription service demonstrates our thought leadership in innovation and understanding what our customers are seeking. We have elegantly packaged the service as a pure music subscription service, which makes it one of a kind worldwide. We are pleased to partner with Idea Cellular for the first launch of the service." The service is a compelling way to generate revenues from the Feature phones and as well the phenomenally growing Android phones. For more information on Dhingana, visit www.dhingana.com. Dhingana is the leading on-demand streaming music service for Bollywood and Indian music fans across the globe. Launched in 2007, Dhingana now reaches millions of users globally, providing access to an extensive library of music in 42 languages licensed from global, national and regional Indian brands like T-Series, Saregama, Yash Raj, Sony Music, Tips and Universal Music. Dhingana is available on the Web, mobile Web and as an app for iPhone, iPad, BlackBerry, Android, Windows and Nokia devices. The company has offices in Pune, India and Sunnyvale, California, and is backed by Helion Venture Partners, Inventus Capital Partners and Lightspeed Venture Partners. For more information, please visit http://www.dhingana.com.